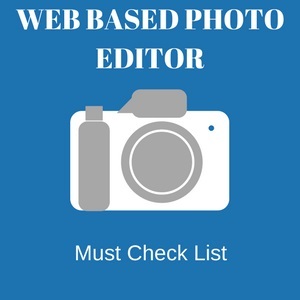 Web based photo editor helps us to edit photos anywhere and on any computer if we connected to the internet with a good browser. Most of them are free and they have paid options too. Pixlr is one of the best web based photo editor from autodesk and around 65% of the facilities of the photoshop can be found here for free. You don’t even need to signup!!!. However , the advantage of creating an account [free]will help you to save the work which you have done previously. And they are saved in pixlr image library [pxd format] instead of psd format. So you can come back at any time to start the uncompleted work or you can enhance the image further. If you don’t want to save in the library you can also export the pxd format and you can import to do further works at any time. Pixlr express is another web based photo editor given by autodesk that provides excellent creative effects, overlays , borders, add text, stickers(You will like it very much after using this) and finally with basic photoshop tools . In Pixlr express , you can create collage which comes with lot of layouts (i.e)You can use 2 to 25 images in one layout. Is it possible to remove ads in pixlr editor by subscription? Unfortunately ,at present there is no way to remove ads in online pixlr editor by subscription, however we may get option to remove ads bys subscription in future. Befunky started in 2007 by Tekin Tatar which is a beautiful online photo editor which encourages newbies to do some photoshop works. Able to access 125 digital effects from befunky library for free More features than befunky basic version and also you can get extra rights for your created image, high resolution input and more. 1.Befunky touch up have lot of tools and it’s wrinkles option helps to hide the wrinkled parts of the image. 2.The cartoonizer part is awesome but it comes with the paid version only. 3.Graphic Designer consists of awesome pre-defined templates like infographics , greeting cards and more. PicMonkey is an awesome online editor for photos created by small team professionals. Can you remember Picnik ? A online photo tool which was acquired by Google in 2013.Later some picnik members left google for their further innovations and thus Picmonkey started!! !.Now the CEO of PicMonkey is Jonathan Sposato. This is a small info about PicMonkey. Let we see Picmonkey online Editor. What are the free plan features you will get in picmonkey? Ads will be in free plan.You know most free plan web based photo editors always come with ads. What are the paid plan features you will get in picmonkey? Fotor is another awesome multi editing tool founded in 2012 which gives vast range of filters and effects. 1.Fotor photo stitching helps to add multiple photos horizontally or vertically. 2.Fotor provides unique tool called as online HDR software. High Dynamic Range (HDR) helps to give clear color of a photo scene .If you have taken photo of a place in different colours (i.e) in different times. You can upload these different color photos in fotor HDR and it will try to give the colour of the place which will be similar to what we are seeing with our eyes. Further we can avoid ghost reduction in photo if utilized properly. 3.In Fotor Artistic Collage, the grid comes with the super pre-backgrounds. 4.If you want to make fun look of collage photos you must try funky collage. The name is funky but it is the best thing which will helps to make your social media posts viral. Adobe photoshop needs no introduction. However let we see some details of adobe photoshop express editor. Adobe in 2008 launched this service with free 2GB service . Besides web editor .Adobe worked on more things like adobe carousel then Adobe Revel. And now to Adobe Creative Cloud. 1.Though photoshop express cannot compete with cloud and desktop app, it performs with its tool. The main drawback of photoshop express tool it accepts only jpeg format. We cannot upload other formats. 2. However it has one advantage it comes with no ads!! !.And the interface looks very neat when comparing other web based tools. You also have the option to set the full screen window. 1.Looks like the editor was not updated . It was still in the year 2013!!!. But it doesn’t mean it has less tools. It has the basic tools of crop,rotate,resize,auto-correct,exposure,redeye,touchup,saturation. 2.It has adjustment options like white balance, highlight, fill-light, burn, sharpen , soft-focus. 3.I like the crystalline and pixelate options which can be found at the effects option. The final thing if you need more options it’s best to move adobe creative cloud. From the name itself you can understand it is full of fun to edit your images. Photo editor option also looks great. Initially I am very irritated with the ads in the website. But when I entered into photo editor things changed. For this first we need to find photo editor which can be found in the top menu. I felt I am using mobile app and the sidebar ads not disturbed the editor!!!. Like slider you just need to click the arrow icons to see the options in the photo editor. It allows to upload basic image formats png,jpg. It doesn’t have any specific plans and pricing and it is completely free!!!. 3.Super tool called animated gif maker where you need add your image to the pre-defined animated gif given in the website. After doing crop to choose exact area you can get animated gif image .And your image was placed with the animated gif !!!! . 4.Filter,Ecards and frame tools were available. Filters helps to give different colours of your image ,cartoon like effect and more. 5. Face effect which you can place the head in superman body. You can get a photo like standing with big celebrities. If you are a pro image user, you can feel a small downside in fun photo box you can use your image for the above options but it just works with , what they have given in the predefined templates and they are small collections. Photocat is started by small photography team by passion. The photocat speciality is you can export(i.e saving) in png or jpeg after editing. Another thing you can do at photocat helps to reduce the size of the photo in jpeg format. You can share the edited images in social networks like facebook, twitter and pinterest. There is no price plans in photocat and all tools are free. The retouch option in photocat is free and it is great because when comparing to other photo editors they are giving it some retouch options are coming in pro plans only. Though in their website the year 2013 not changed in copyright we hope they will come with some updates. If you want to quickly edit your photos, free online photo editor will do it for you. Free online photo editor was developed by zygomatic. Zygomatic is also developing online games since 2003. Instead of giving collage maker in Free online photo editor, zygomatic providing it in a separate website called photocollage. Zygomatic also have websites like glitter photos , online charts tool and more. Let we see details about free online photo editor. From the Name itself we can understand the editor is free .A unique thing is you can order it as a frame , canvas or a poster which comes with a paid option. If you want to need more details about this you need to see canvaspop site. What are the useful features at free online photo editor? Free online photo editor have all the basic features like other image editors. It has one cartoonize effect which I like most because some other sites are having this in pro option. And some software put watermark in picture inorder to buy the softwares. Though you can upload a image of 6MB only it has another option that more than 6MB it will be automatically resized to 1024x 768. Pizap online editor has a unique tool called as “cut out tool” which has the concept paint the part which you want to keep. It’s like a brush tool and so it’s very easy to use this. This option is not available in other photo editors. The best thing in pizap is you can find huge collections in stickers. Another unique option in pizap is it has meme generator which is very simple but nice. · Pizap has paint tool which create a illusion whether using a real brush and you should check it out. · Pizap has other tool “emoji maker” which you can create for free!!!. You can covers for facebook , twitter and even youtube. Photomania is another photo effect web app which have cartoonizer effect for free .Photomania doesn’t have basic online photo editor. But you should try this. 1.You can create popart, camera effect, painting effects and more. 2.The fun option comes with billboard,magazine,illusion,drawing,humour,sports,celebreties,entertain,frames,fantasy. 3.E-cards option also you should check it out. Lunapic is simple editor and it has more uploading options. (i.e) You can upload images from Desktop , Facebook , Chrome , Instagram , Dropbox , Picasa app. Lunapic has 200+ effects and have the option to create gifs from videos or images. TuxpiDid we miss one? Let us know, or leave your personal favorites in the comment section.